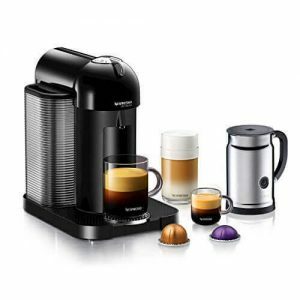 The Nespresso Vertuoline is a simple machine, but with a gorgeous collection to enhance your coffee experience. Service is ready just at the touch of a button, thanks to the improved brewing system and the newly redesigned capsules. Beauty and Sturdy Completion: The Nespresso VertuoLine is one of the robust espresso and coffee makers with a charmingly intuitive layout. Simple in Operation: Operating this machine is very simple, just like any other single serve coffee machine. Choose the capsule of your choice and put it in the holding base. High-Capacity Water Reservoir allows you to brew without having to refill. Incredibly fast: The 15- 20-second heat-up process guarantees your delicious coffee in just a one button push away. Highly Priced: it’s considerably more than its competition. This is Nespresso VertuoLine, simple but with uncompromising standards. Vertuoline standards are rarely met by the world’s coffee makers. The principle here is: to the ultimate perfection. Disregard of what you’re serving, coffee or espresso, half-caff or hazelnut-flavored, nothing less than perfection here. The different forms of capsules and their varieties ensure that ultimate tastes and preference is reached for every coffee or espresso, just what will suit you. Unquestionable results, unbeatable convenience, uncompromising standards. VertuoLine serves virtually all people, fit for every occasion. More perfect for people who are always on the go, always in a hurry. Efficient for students as well as it provides a quick warming up for morning preparation and prepares students for urgent events like talks, tests, or symposium. The machine also is suitable for domestic use, it can help you a lot especially when a visitor comes by and finds you unprepared. Of course, it is more streamlined for personal and office use. When this machine comes, it has the accompaniment of a sample pack for every brand. Since there is a total of 12 different capsules, you’re going to select the one you love most. Hence, a free sample pack is incorporated, you are going to taste all the varieties until you decide which pack is the best. Of the 12 capsules, 8 capsules are for brewing coffee and 4 for making espresso. For the 8 coffee capsules, 4 capsules have been designed to enhance a perfect taste and preference. They offer a range of intensity, from bold to mild. The other 2 are for flavored roasts: hazelnut and vanilla. Additionally, there is 1 capsule for a half-caf and 1 decaffeinated option. Likewise, the 4 espresso capsules are designed to give a wide range of intensity as they have the decaffeinated also. The preheating speed of this machine is breathtaking. Just literary 10 seconds and the Vertuoline will be ready to make an espresso or a coffee cup. This speed is astoundingly fast when you compare it with most single serve brewers in the market. The combination of technology just provides a more relaxed mood. The machine will switch off and on, as well as indicate the water level and even show when the water is still heating up. This will be shown by the button on top of the machine; it will keep blinking to indicate the water is still preheating. When it comes to real taste now, but just by the look, you will actually tell the difference from other single brew coffee makers. An attractive crema builds up on top of the coffee and just settles still. You might think it is the coffee version of an espresso. The look will exactly tell you that, but the taste, very soft and smooth. The spinning of the capsule combined with its Centrifusion Technology makes the machine a little bit louder than either the Original Line Nespresso or other single serve brewers. The sound is not that irritating, actually not as loud as the bender, but probably louder than most of the coffee machines. You may want to call this VertuoLine’s drawback. However, brew cycle catches up and is very fast, the more it works, and the faster the rate of spinning improves. Centrifusion Technology: The machine is incorporated with this type of technology that scans every capsule and automatically adjusting the brewing to get a revolutionary one-button experience. Automatic Shutoff: This allows for shutting down after nine minutes of idling. 2 Pre-Set Cup Sizes: Basically, there are the coffee (7.77 oz.) and espresso (1.35 oz.). You can customize the brewing in the range of 0.3 oz. And 17 oz. Descaling Alert: Warns when the next descaling process should take place. Revolutionary Centrifusion™ Technology is part and parcel of this machine. 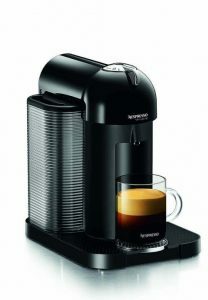 It is what makes VertuoLine outstanding amongst most Nespresso machines. This technology herein works by instantly recognizing every capsule. The machine automatically adjusts the brewing to bring out the best value for each blend. The cup sizes can be customized — from as small as 0.3 ounces to 17 ounces. This is an ultimate assistant to enable you to tailor your brewing needs, be it just filling travel mugs or brewing something altogether different. 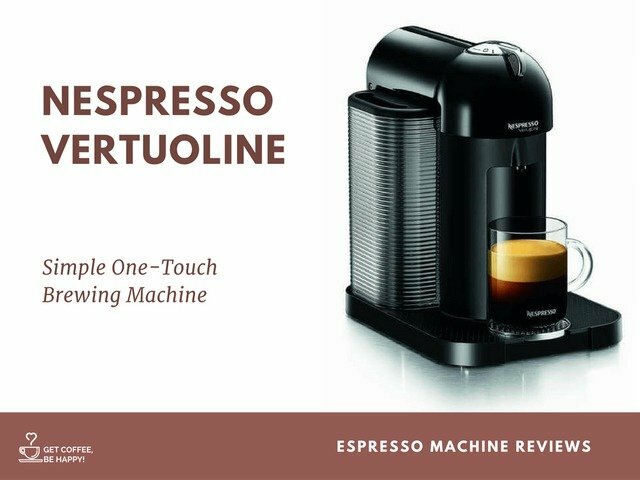 As featured in most of the coffee makers reviews, VertuoLine is referred to as one machine with two tastes. Boasting of its Centrifusion Technology, the touch of just one button, and as well coupled with several capsules, this countertop barista is just going to get you exactly what you want, virtually all the tastes you may dream of. It is very awesome considering the heat up speed for just 15 seconds; centrifusion technology will just be on watch reading the code on each pod to bring out a blend-specific brew that suits your taste bud. 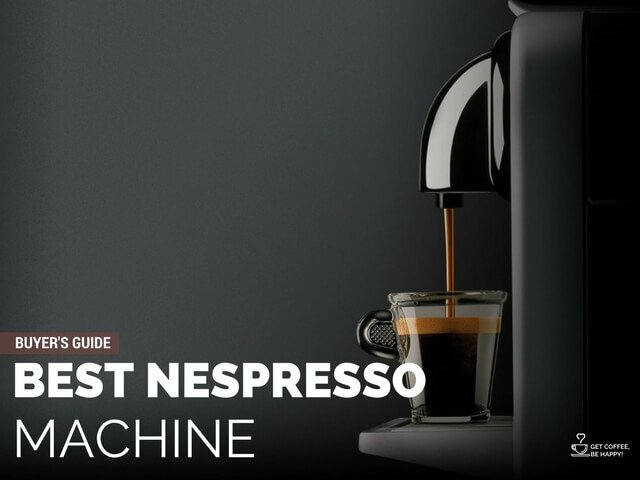 Nespresso VertuoLine comes in Black, Red, or Chrome. The machine has a retro vibe that I really like, especially since other models we’ve tested offer function, but very little character. - Dimensions: 8.32 x 11.93 x 11.91 in. - Box Dimensions: 10.38 x 14.57 x 14.09 in. - Water Tank Capacity: 40 oz.